By Chris Williams: You know things are bad when you have Bob Arum rejecting Floyd Mayweather Jr. for a bout against his fighter Manny Pacquiao for the sake of Arum putting him in with one of four fighters – Timothy Bradley, Miguel Cotto, Lamont Peterson and Juan Manuel Marquez – that Arum has personally selected for him to fight. Arum is basically down to the bare essentials in picking opponents out for his Filipino star. It’s so bad that Arum is now looking to match Pacquiao with former Pacquiao opponents, which in this case are Miguel Cotto and Juan Manuel Marquez. Boxing fans just saw Pacquiao fight Marquez for the third time, and like the other times they fought, Marquez wasn’t given the decision. Arum is interested in seeing them fight again because of the money that Marquez brings in from the Mexican fan base of Marquez. Arum wants to see Pacquiao do better than he did last time. I don’t know if he can but I don’t think it really matters. The judges probably won’t give Marquez a win over Pacquiao unless knocks him out or beats him senseless. 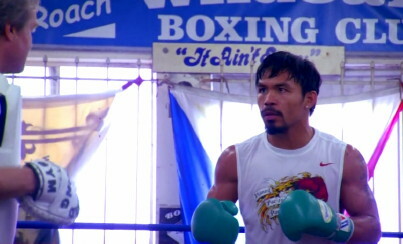 Pacquiao is the star and stars in boxing are almost impossible to beat by a decision unfortunately. Pacquiao because Cotto so badly that boxing fans are still turned off at the idea of Arum putting Cotto back in with Pacquiao. But since Arum has already exhausted pretty much his entire Top Rank team, with the exception of Mike Alvarado and Brandon Rios, he’s now using retreads like Cotto. Peterson and Bradley are not big sellers in bringing in fans. Bradley is more of an investment for Arum than someone that he can cash out right now against Pacquiao. Arum needs to put Bradley in against better opposition to increase his value before he cashes him out. I just don’t know if Arum has the patience to wait two or three years for Bradley to build a fan base before he put him in with Pacquiao. Besides that, Pacquiao may not be around in two or three years. If Arum matches him now, it will be like Pacquiao is being put in with Joshua Clottey again because Bradley is about as popular as Clottey. He’s not going to excite anyway and if Arum thought he was getting a future PPV star when he signed him up, he’s likely to be in for a rude awakening when that fails to happen. It’s still hard to believe that Arum turned down Mayweather for these four guys. It makes it seem like Arum is just interested in milking Pacquiao rather than having him really tested. I guess it’s a good move for him and a good move for Pacquiao. Arum continues to make good money with Pacquiao beating guys that aren’t in his class, and Pacquiao doesn’t have to see his paydays drop after a loss to Mayweather.